The Scandinavian Human Dignity Award is presented to a person or an organization which has made a special contribution to human rights, all of which derive from the inherent dignity of the human person and are essential for his free and full development. The Scandinavian Human Rights Committee has chosen to honour Mr Roger Kiska on behalf of the Alliance Defending Freedom for his promotion and encouraging of the effective exercising of the human rights and freedoms by granting him the Scandinavian Human Dignity Award 2012. 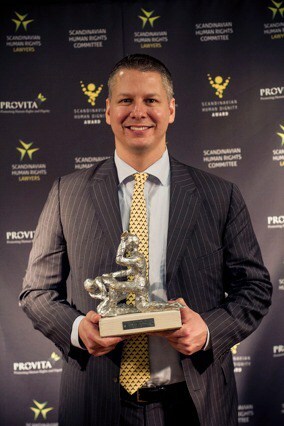 The Award was granted to Mr Kiska at a ceremonious reception at the 28th of November in Uppsala, Sweden. The Scandinavian Human Rights Committee finds that Alliance Defending Freedom during the last years has encouraged action to overcome infringements of human rights in Europe and has promoted a greater understanding of and respect for human dignity. The battles fought in courts and legislatures to promote the dignity of the human person, the rights of conscience and other fundamental human rights make the organization worthy of the Scandinavian Human Dignity Award 2012. With more than 2100 allied lawyers and nearly 200 allied organizations working for the promotion of religious liberty, the right to life from conception until natural death and protection of the natural family, the organization has truly become a global force and a great Scandinavian partner. Roger Kiska serves as legal counsel with Alliance Defending Freedom and is based in Vienna, Austria, where he specializes in international litigation with a focus on European law. He has developed the Alliance Defending Freedom Allied Attorney Network in Europe, working with allies to litigate European cases. Prior to joining Alliance Defending Freedom, Kiska served as legal counsel at the European Center for Law and Justice. After earning his J.D. at Ave Maria School of Law in Ann Arbor, Michigan, Kiska began his legal career in the Slovak Republic as an attorney with the firm of former Slovak Prime Minister Jan Carnogursky.